We worked in tandem, Saathi and I, assembling our Golu Padi. I held the wooden frame while he drilled, hammered and brought it all together. Ammu and Pattu hovered around, stepped on toes and whizzed around in the swivel chairs. Laddu orbited around all of us sometimes chasing a ball and other times digging in the tool box. Three hours later, the frame stood assembled. It would take another day or two for the dolls to find a home and yet a few days before we had people over. What I realized this time around is that as much as my inertia makes me want to wish away the grunt work that goes into getting prepared for the festive season, there are many, many reasons to shake it off and get moving. Ammu and Pattu more than made up for my lack of enthusiasm by unwrapping the dolls from the bubble wrap, setting them up and stepping back to admire their efforts. Because I promised them a row all to themselves, they ferried toys from their room and heaped them to one side. Even as I directed where the other dolls went, Pattu hopped on one foot eager to get started on her padi. When the golu was all set and I was about to switch the lights off and step away, both the girls fell on their knees, closed their eyes and murmured something to their God. Shamed, I did likewise and gave thanks. All day they have been going up and down, looking at and admiring their Golu. “When are our friends coming?” is a refrain I hear every so often from them. As we assembled the thamboolam bags, they went about counting each item in the bag and reassuring me that every bag was perfect. “Are we having our Indian and non-Indian friends Amma?” they ask. “Yes” I say even as they talk to each other about how they are going to explain the tradition of Golu to their new friends. They stand by my side as we get ready to go Golu hopping. I rummage in my closet for bangles to go with their clothes. Even as I set some that matches what they wear, I see confusion in Pattu’s eyes. She feels torn wanting to wear them and fearful about what people will think about her. I leave it to her and focus on Ammu who is happy to wear as many as she can. She walks away, her paavadai swishing and her bangles jingling. Pattu reaches out for hers. 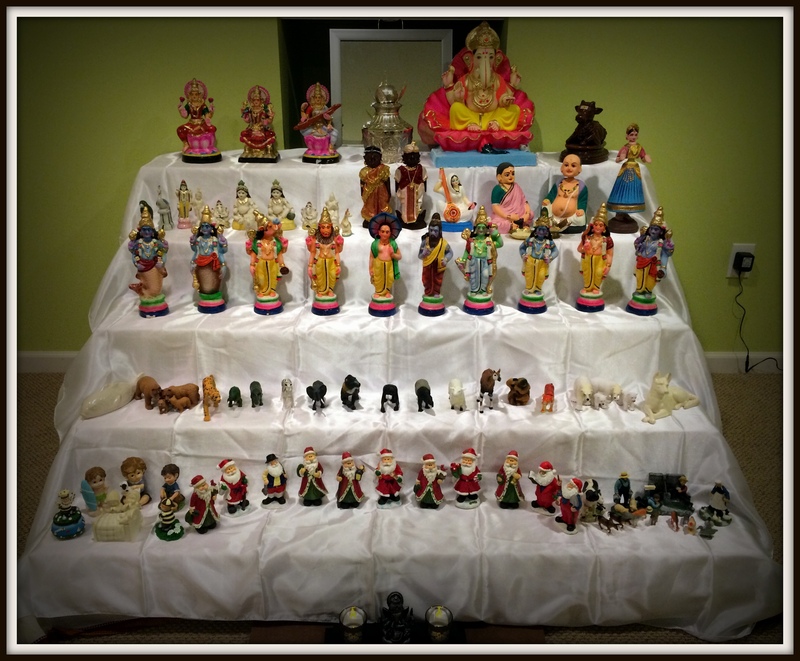 As we stand up and admire a friend’s Golu, I see Ammu and Pattu look at each piece curiously and ask questions. I also see their faces light up with joy as they identify pieces they know and recall the stories behind them. I seat them with their friends on a mat on the floor and load their plates with a little bit of different kinds of food. I watch them sample and nod approvingly as they eat. When I walk in to clear their plates, Pattu surprises me with a request for one more roti. This year’s navarathri has been one of many lessons for me. Even if the origins and meaning of the festival are not clear to me, it is obvious that Navarathri provides a much-needed avenue to talk about religion, about forms of worship and specifically about the female divine force. As a mother of all girls, I love talking about the bravery of our Goddesses. Watching their peers parade around in ethnic clothes and celebrate all things dressy is a way for me to get my children interested in bling. Most of all, it is the perfect excuse for me to flex my cooking chops and prepare those dishes I keep putting away for another day. Here’s to much feasting and festivities. Happy Navarathri to my friends! I hear you. Taking the golu padis out and going past the eye rolls is the most difficult part. Enna speciala cook panna? I did experiment with a different way of cooking the lentils (boiling rather than pressure cooking) and feel confident of avoiding the mush on some of the trickier varieties. True that. So far just sundal and aval kesari. Today rava kesari, sundal and kalanda sadham. Thinking chakkara pongal for tomorrow and vadai payasam for dasami.